I start most trips with good intentions to PLAN and the worst application when it comes to, you know, doing it. Which means I end up with some last-minute plane reading if I’m more organised than usual… or some frantic scrolling through my favourite travel blogs in the passport control line if I’m not. Japan was different, though. Not just because I’d decided that I need to get better at this full-time traveller/digital nomad thing, but because I knew Japan would be special. There are more things to do in Japan than days in the average life, and my bucket list was overflowing before I even arrived. If your heart doesn’t melt a little at the sight of this snow monkey shaking off the hot spring water, you should probably click away now. If it does, this is the one thing worth adding to your Japan itinerary – even if you only have one week in Japan. Seeing animals in the wild is always a special experience – and it’s nearly always a bit of a luck-fuelled mission, too. So let me give you the good news right now: Getting up close and personal with the snow monkeys in Japan couldn’t be easier. You’ll have to go on a slight mission (if you count a 30-minute walk through the forest as a mission, that is), but you’re pretty much guaranteed to see lots of these adorable creatures. In fact, you’ll probably find yourself surrounded by the little guys. That’s because, in one part of Japan, the Japanese snow monkeys – or Japanese macaque, if you like to use their proper name – have cottoned on to one of the Japanese people’s greatest rituals: the onsen. If that word means nothing to you, let’s pause for a mini Japanese crash course. An onsen is a natural hot spring used for bathing in Japan. Japan has thousands of onsens and a trip to an onsen town is another must for anyone visiting Japan – but more on that in an upcoming post. 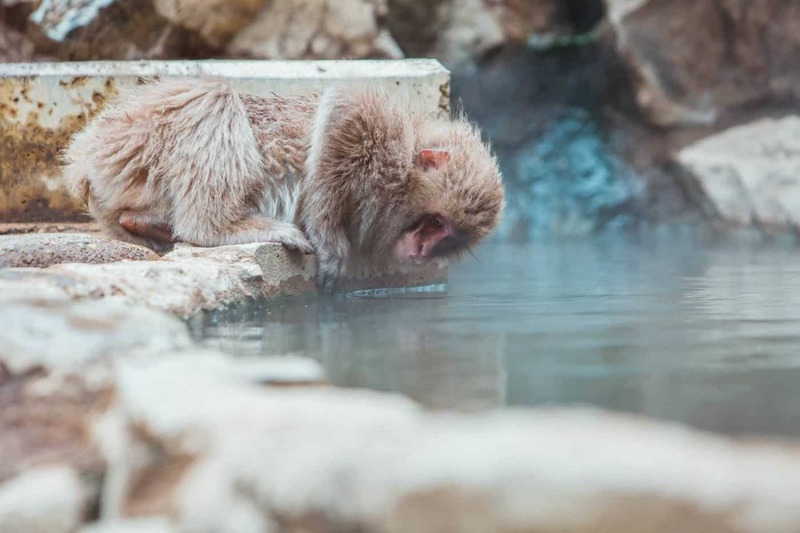 In one onsen, a group of local snow monkeys started using one of the natural hot springs and, in true Japanese politeness, the humans left the hot spring to be a monkey bath. 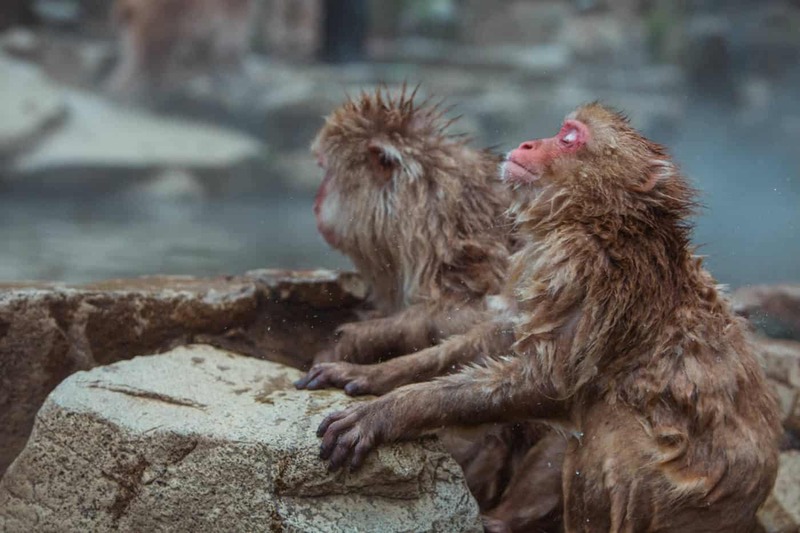 Now, it’s the only place to see bathing monkeys in Japan – and the world. If you want the best onsen experience in Japan, Hokkaido is the place to go. As Japan’s northernmost island, Hokkaido is the ultimate place to experience mountains, snow and a much-needed hot spring after a day exploring. Even though Hokkaido may be the snowiest part of Japan, however, you won’t find any wild Hokkaido snow monkeys because it’s too cold for them there! To see the snow monkeys, head to the much milder climate of Jigokudani Monkey Park, located in the Nagano Prefecture. If you’re already planning to visit Nagano, add the snow monkey park to your list of things to do in Nagano. Jigokudani Monkey Park is an easy day trip from Nagano station. You can either take a train to Yudanaka station (44 minutes) and then take the local bus to the park, but the express “Nagaden bus” runs directly from Nagano station to the Snow Monkey park and takes just 41 minutes. That also means that it’s possible to take a day trip to Jigokudani Monkey Park from Tokyo to see snow monkeys. The JR Hokuriku bullet train from Tokyo to Nagano takes 1 hour 20 minutes, so you can be at Jigojudani Monkey Park in around two hours. If you don’t have a Japan Rail pass, it costs 8,200 Yen (around $82) each way and there are around four trains per hour. 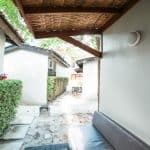 The final option is to stay in the nearby town of Shibu Onsen, from which Jigokudanai is only a 10 minute bus ride (and short walk) or a 45-minute walk all the way there. It’s uphill but through an amazing forest, so well worth the trek if you’re up to it. 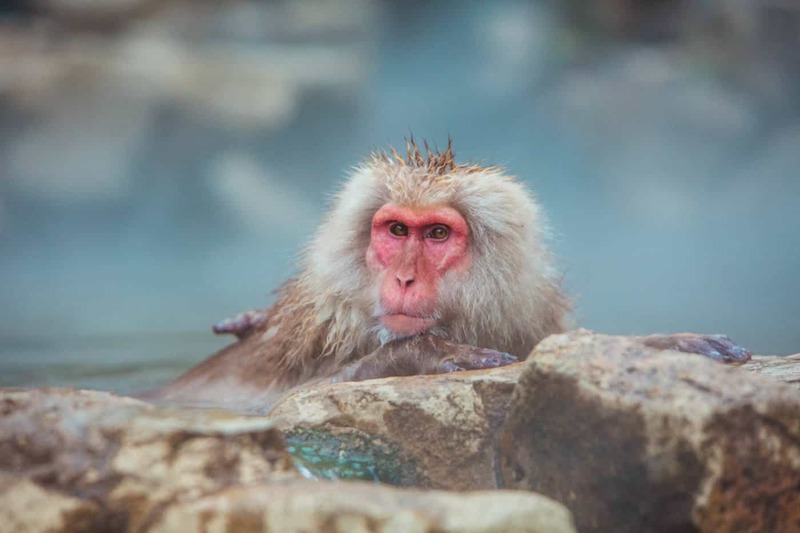 If you want to spend longer at the snow monkeys hot springs – and enjoy some of the human hot springs, too – it’s worth spending a night in Shibu Onsen, one of the two closest towns to Jigokudanai Monkey Park. This cute town has some of the most eclectic little restaurants I’ve ever eaten at as well as more public hot springs than anywhere we visited in Hokkaido. If you have limited time in Japan and want to combine three Japan bucket list items at once, Shibu Onsen is the place to be. 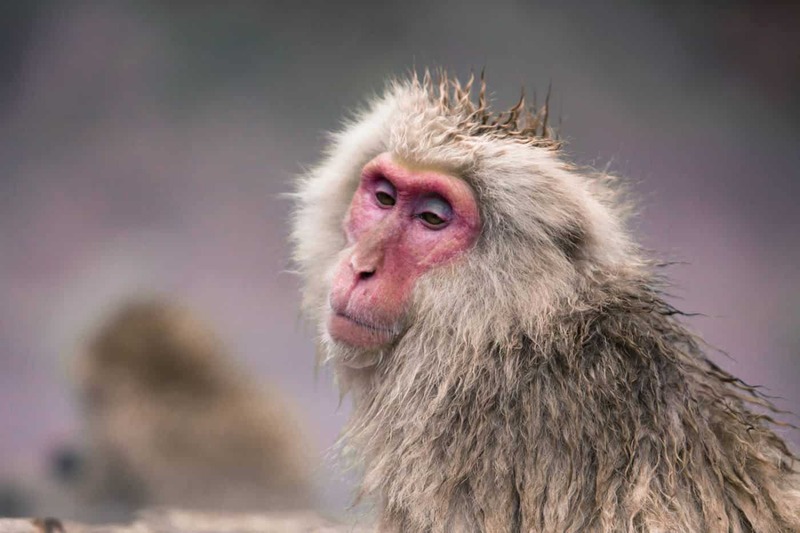 You can stay in a ryokan, visit an onsen and see the snow monkeys all in one day! If you want to see the monkeys in the snow (and see the monkeys bathing all day), you’ll have to make a trip to Jigokudanai monkey park during the winter months. That said, we went at the beginning of April and it was still a magical experience. While there was no snow when we visited the monkey park, the monkeys would still bathe in the hot springs from time to time – just not all at once. It kind of made it an even more special event; everybody crowds around, silently waiting in anticipation, every time a monkey tests the water. 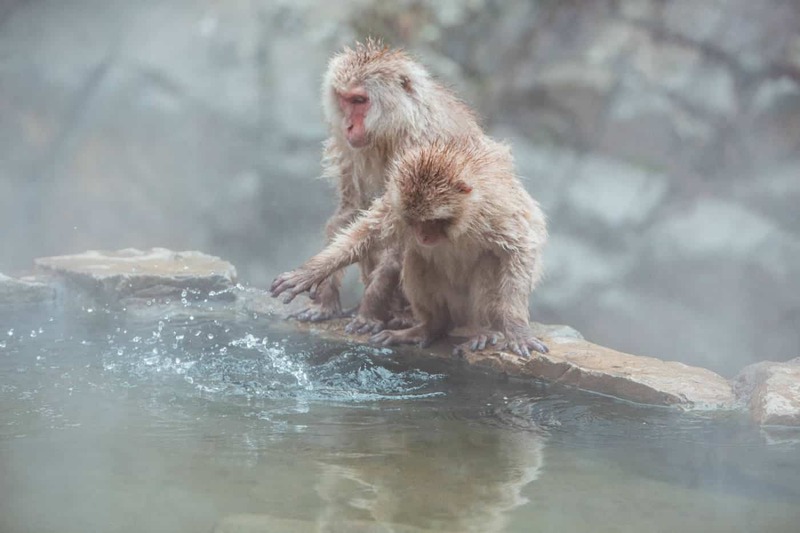 If you want the best chance of seeing the bathing monkeys in the hot springs during the springtime or milder months, it’s best to visit Jigokudani Monkey Park as early as possible. The park opens from 8:30am for the summer (from April onwards) and the monkeys are most active – and most cold! – at this time of day. Find out more about Jigokudanai Monkey Park – and watch the live cam! – on the official website. Eeeeeeeek! So cuuuuuuuuute! This is literally the reason I intend to go back to Japan; it’s the one thing I didn’t get to tick of my wish list and it looks amazing!